CRAFTSBURY, Vt. - The Northeast Kingdom is renowned for its mountain views and pristine lakes, but ethnic cuisine has never been considered one of the region’s strengths. In recent years, however, two farmers’ markets have attracted a surprising international array of vendors serving global cuisine. In addition to local fruits, vegetables, baked goods, and cheeses, the market here and in Hardwick might feature French crepes, Indian samosas, Israeli falafel, Bulgarian grape leaves, and Mexican gorditas. Much of the food is prepared with ingredients from the cooks’ own gardens or from nearby farms, yielding a rare combination of ethnic fare made with local ingredients that can be hard to find even in urban areas. The high quality, homestyle cooking makes blissful outdoor eating. Children frolic to the sounds of live bluegrass at the Hardwick farmers’ market. Samples of sheep’s milk cheese and mead are doled out by Bonnieview Farm and Caledonia Spirits, and High Mowing Organic Seeds offers tastes of 11 varieties of cucumber and 12 kinds of tomatoes, their table a glistening rainbow of red, green, yellow, orange, and purple. This place is the subject of the book “The Town That Food Saved’’ by farmer Ben Hewitt, and the vibrancy of the food community is palpable. A hand-carved sign heralds The French Tart, a stall selling delicacies of Normandy as interpreted by Montparnasse native Carole Drury, 52. She grew up eating French food but didn’t learn to cook until she and her family came to the United States after the 1968 Paris political turmoil. She cooked at a French restaurant in Stowe and at several other Vermont kitchens until she decided to sell her own fare at five markets each week. The fillings for her crepes include curried rice, ham and Cabot cheddar, and black currant compote. The crepes themselves are plush, their contents flavorful and well seasoned. Her dinner tarts are topped with roasted vegetables grown in her eight garden beds or in the greenhouse on the roof of her Greensboro home. In the fall she gathers apples from abandoned trees where homesteads once stood. She uses these to make a compote, on top of which she floats a layer of brandy. Her black currant compote uses organic vodka from Green Mountain Distillers in Stowe; she suggests spreading it on fresh bread. The Craftsbury market occupies the emerald turf of the town common, which is ringed with quaint houses, a Post Office, school, and church, all painted white. Martha Avila, 33, from Honduras, has made a reputation here and in Hardwick with her unique assortment of samosas, which have fillings of chicken, apple, and one she calls “cheesy broccoli.’’ “I have a passion for making samosas,’’ says Avila, who hopes that income from her market venture will help bring some of her children to the Unites States. “Grandma’s recipe,’’ is how Albena Nasseva, 40, describes many of the foods she learned to make in Sofia, Bulgaria. Her dishes include tarator, a thick and tangy cucumber and yogurt soup that goes perfectly with hot weather. “It’s kind of similar to the Greek tzatziki sauce,’’ says Nasseva. “We are neighbors. Who knows who started it first?’’ She also stuffs grape leaves with rice, carrots, local grass-fed beef, and herbs and spices brought by her parents, who visit each year. “It’s very rich. It’s beautiful,’’ she says, describing the food of Bulgaria. Nasseva came to the 10-year-old Craftsbury market early on, as did Chole Adams, who sells burritos, gorditas, tamales, salsa, and horchata. Craftsbury also has a falafel stand run by Zach Hartlyn and Nadav Mille, both of whom lived in Israel for several years and now cook at Sterling College, which is visible from the market. Their pita is made by an Israeli baker at The Magic Spoon Bakery in Hardwick, and they grow their own herbs as well as the cucumbers and tomatoes for the topping. Mille’s mother makes the pickles. Some patrons have never seen falafel before. “Part of our marketing spiel is that it’s like a crunchy meatball sub, only it doesn’t have meat, and it’s in a pita bread,’’ says Mille. Hardwick farmers’ market is on Granite Street in Hardwick, Fridays 3-6 p.m. through Oct. 7. 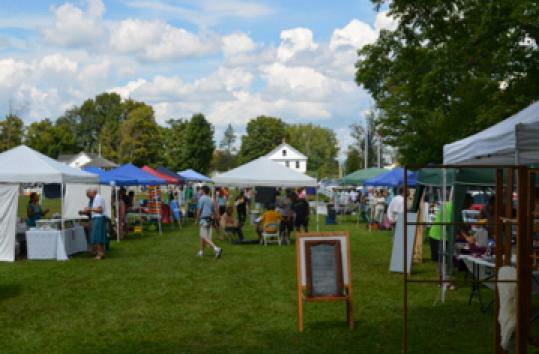 Craftsbury market is on Craftsbury Common in Craftsbury, Saturdays 10 a.m.-1 p.m. through Oct. 8. Aaron Kagan can be reached at aaronwkagan@gmail.com.